There are lessons to be learnt from Japan, given the dilemma it finds itself in. Should it continue running its 50 nuclear power plants or do away with them within a specific time frame? Opinions, after the Fukushima disaster, are sharply divided. The latest attempt by the Japanese government to chalk out a roadmap to end its dependence on nuclear energy has only led to more confusion. Once you are in the thick of a nuclear programme—Japan derived 30 per cent of its electricity from nuclear energy—exit options become more than difficult. On September 14, Japan released a policy, Revolutionary Energy and Environment Strategy, which seems to suggest that the country would forsake nuclear power by 2040. The emphasis was on not to build nuclear power plants, to restrict the age of power plants to 40 years with no option of renewing licences, and allow only those that are deemed safe. But five days later, the Japanese Cabinet stopped short of endorsing the new policy. On the same day, a senior minister of the Cabinet made a vague statement that the government will “still act” based on this policy. On the face of it, it seems the government is caught in a double bind with pressure exerted from both the pro- and anti-nuclear lobbies. Throughout summer, anti-nuclear protests were staged outside the Prime Minister’s office. On August 22, after a week of demonstrations, Yoshihiko Noda met a group of protestors in his office, which was termed “victory” by the group. Meanwhile, Keidanren, the Japanese industry federation, has called the nuclear roadmap “unrealistic and unreachable”. But nobody seems to be happy with the current policy flip-flop. Public opinion polls conducted by one of the two most popular Japanese newspapers, Asahi Shimbun, found that more than two-thirds of the respondents were not confident about the safety measures initiated by the government to protect nuclear plants post-Fukushima. Only one per cent were confident about the measures, found the poll conducted in August. Interestingly, majority of them said they had more confidence in renewable energy, like wind and solar power, than in nuclear. But public perceptions alone will not sway the government. Before any decision is taken, there are several issues that need to be resolved. This includes cost of switching to other forms of energy, foreign policy (the US is Japan’s closest business ally), nuclear waste reprocessing (it is done mostly in foreign land like France and the UK), carbon mitigation targets and future of close to 45,000 people that the nuclear industry employs. Nuclear is like a bad habit difficult to get rid of. Closed nuclear plants do not mean zero nuclear. Japan would have to deal with its high grade nuclear waste, which was once foreseen as an unlimited resource for future generation. Media reports say that the stockpile is more than 45 tonnes of plutonium that can power 5,000 nuclear missile warheads. Most of the light water reactors in Japan produced this as a by-product. Of this, a huge chunk is kept in France and the UK. But both these countries are unlikely to hold on to this extremely toxic substance once Japan decides to exit the club. According to media reports, after the announcement of zero-nuclear policy British Ambassador to Japan Sir David Warren visited chief Cabinet secretary Osamu Fujimura to get an assurance that Japan would take back the containers of nuclear waste from its soil. The French are planning a similar request. If returned, where will this waste go? At present, the Aomori Prefecture in Japan is used as the temporary storage facility for nuclear waste. But this arrangement cannot go on forever. With popular opposition against nuclear, no prefecture will allow more storage space to be built. Japan’s dilemma does not end there. To build renewable power and a grid around it, the government estimates a spending of US $622 billion, something that will not happen overnight. Since the closure of nuclear plants after Fukushima, Japan has been mostly relying on imported gas from the US; its gas imports has increased by close to 20 per cent. With renewed dependence on fossil fuels, even if temporarily, meeting climate change targets of reducing emissions by 25 per cent below 1990 levels seems far-fetched. If Japan wants to meet these targets, as Bloomberg Businessweek reports, it will have to buy emission reduction credits to the tune of 320 million tonnes. Will Japan’s nuclear woes ever end? Are there any lessons for nuclear power wannabes? Either way, Japan finds itself caught between the devil and deep sea. Japan had 50 atomic rectors which supplied nearly one third of its energy requirements. Debates have been going on in Japan which is more important for survival, the surety of danger from existing power plants or a non-nuclear future. Electrical needs of this heavily industrialized country are enormous. the likeliness of these reactors becoming a sure danger to the whole nation in the future or the need to continue to remain them operable to cater to the electrical needs of that heavy industrialized country. Before the accident at the Fukushima Nuclear Plant, Japanese authorities had been determined on a 50 percent reliance on nuclear power by 2030. Government, politicians and the industrialists wanted them to remain but the people want them to go. Japanese government tried in every way to suppress them and keep those reactors like the governments in India, China and Russia do but the change in worldÃ”Ã‡Ã–s public opinion against the use of nuclear reactors changed things in peopleÃ”Ã‡Ã–s favour. Japan now has declared that it would become nuclear-free by 2030 which news was a shock to all nuclear countries. There is anxiety about how Japan will bridge the energy deficit caused by this shutting down of all nuclear plants and about the heavy expenditure they would incur on account of import of fossil fuels like petroleum and gas and the increased emission of greenhouse gases they can expect but those who are well aware of the scientific and technological progress the Japanese acquired since World War Second believe that Japan can surely make up for the lost energy by way of developing natural energy sources fast. In fact, they believe Japan with its advanced scientific progress can actually devise innovative methods to tap renewable energy sources as a crash programme and lead the world. If the sky is to fall down, will they sit inert with their technology? Like the Indian National Congress in India, the Liberal Democratic Party of Japan sat on the throne for 50 years and made this nuclear empire for their industry and a monetary fortune for their pockets, till they were thrown out of power and replaced by the Democratic Party of Japan. This future nuclear ban was the decision of the ruling Democratic Party of Japan but the businessmen and industrialists of Japan want LDP and nuclear energy back. Japan has a very powerful business organization named Keidanren which strongly opposes JapanÃ”Ã‡Ã–s move for a non-nuclear future. 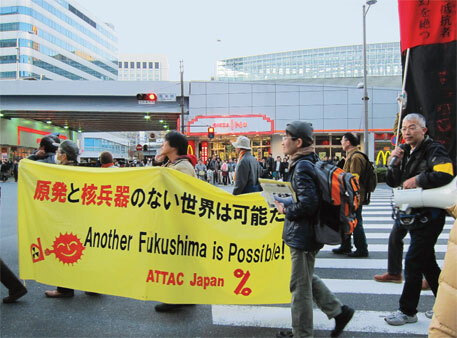 In spite of their resistance, Japan government can only adopt a no-nuclear power policy in the future. It has been estimated that JapanÃ”Ã‡Ã–s unemployment rate without nuclear power would be 7.3 and with nuclear power 6.1 in 2030. This means, having dependence on nuclear power would reduce unemployment rate by 1.2 percent only. This statistics was arrived at assuming that Japan will depend 25% on nuclear energy. Even if they decide to depend 100% on nuclear energy, they cannot wipe out unemployment there. When in 1970 Japan had only two nuclear power plants, in 2012 it had 50 such power plants, meeting JapanÃ”Ã‡Ã–s 30% power requirements. After the Fukushima incident they began to close them one by one, under the guise of maintenance. When compared to Russia, Japan is far better in Atomic construction. Closing of their last power plant in May 5th 2012 was an occasion of celebration for its people. Even though the people living in towns housing these plants were somewhat reluctant to see these plants go out of action for fear of losing jobs and subsidies, 99% of the Japanese rejoiced in the closing of these plants. Statistics show that if the people there can conserve 30% power, there would be no need for these power plants in Japan, or anywhere in this world for that matter. The Japanese government and their parliamentarians like to think and like to picture that the people there are divided on this issue. The Japanese authorities simply do not want to close this source of cheap and easy energy and they do not wish to fume their heads over the problem of how and wherefrom energy can be tapped, once this source of nuclear energy dries up due to peopleÃ”Ã‡Ã–s opposition. The people of Japan have every right to oppose nuclear reactors. For 65 years these people were going through the pain of diseases caused from atomic radiation. At one time, even fishes in their rivers had three heads caused from atomic mutation. Japanese women still fear if children would be born with no head at all. A few young power-hungry politicians in their townsÃ”Ã‡Ã– administrations and in their central government demand restarting the closed nuclear power plants in Japan. They can do this because their fathers and mothers had been living safely abroad in 1945, the year of the Japanese holocaust. Russia, IndiaÃ”Ã‡Ã–s partners in the controversial power project in Tamil Nadu is considered experts in nuclear safety by Indians but they proved thoroughly incapable and irresponsible when Chernobyl accident occurred in their land Russia. And by joining with Russia to share the inevitable know-how, India has proved that she has practically no knowledge of constructing such a huge power plant herself. No nuclear reactor built in this world has claimed that it is fool-proof. The first ever dialogue to be heard thus was from India from the builders of Koodankulam power plant. Even countries which are very advanced are dismantling their nuclear plants and not starting building any new ones. The position is neither India nor Russia is competent in this matter. They never have revealed how much money is earmarked for keeping the nuclear waste safe for the next 6000 years. In fact, Japan, Germany, United States, China, Russia, India and France have never declared how much amount they have earmarked for spending on keeping their nuclear waste till its half life period expires. Disclosure of that amounts alone will make people riot over the construction of nuclear reactors.